I've been cleaning the house like a mad person this week in preparation for Leo's grad party this weekend and WOW does it feel good to have a clean house. The weather has been gorgeous, so I can even have the windows open to let in the fresh spring air! My right hip has been bugging me lately so I'm trying to take it easy and clean like crazy instead of run (it's so beautiful, though, maybe I'll sneak out for a very slowww easy run today). We're hanging on the porch now; E is sleeping and I'm writing baby/graduation Thank You's like it's my job and working on next month's meal plan. Ladies' Bible study is at my house tonight, so I baked some goods today. 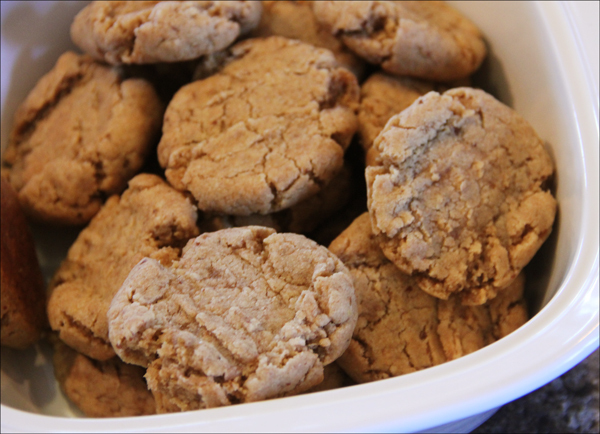 I'll call them Peanut Butter Flax Cookies; they are delicious so I packed them away before I eat them all! - Put butter, peanut butter, and sugars in a bowl. - Mix until light and creamy. - In a separate bowl mix the flours, salt, and baking powder. - Place scoops of cookie dough on a cookie sheet and bake for 15 minutes. Party Punch - This is a edited version of the punch served at E's baby shower. I figured we should skip the cute rubber duckies floating in the bowl for a grad party! - In a large bowl, combine Kool-Aid packet, sugar and chilled juice. Stir to blend. - Slowly add chilled ginger ale. - Brown beef and onions. Drain grease. Add bacon. - Mix remaining ingredients and heat in slow cooker until heated through, at least 2 hours. We will be grilling hotdogs, hamburgers, and will have an assortment of chips and cookies. I sure hope the weather cooperates! What are your favorite party dishes?